One of the most worried about illnesses is the Ear infection. They also are the most common reason for antibiotic prescriptions. Fever – usually low grade (101º – 102º); may not have a fever. 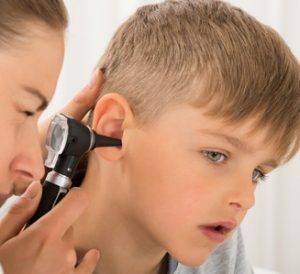 No cold symptoms – if your child has some of the above symptoms but does not have a cold, an ear infection is less likely, unless your child has had an ear infection in the past without a cold. Pulling at the ears or batting the ears in infants less than 1 year of age. Infants less than one are unable to precisely localize their ear pain. This means that they cannot tell that the pain is coming from the ear or from structures near the ear. Infants can pull on or bat at their ears for two other common reasons: Teething – Baby thinks the pain from sore gums is coming from the ears Because they like playing with their ears – Infants are fascinated with these strange appendages that are sticking out of the side of their head. They love to explore them, play with them, and especially to stick their finger into that strange hole in the middle. No complaints of ear pain in a child who is old enough to tell you, usually by age two or three.